This week, I'm back in Scandinavia with a look at the city of Copenhagen. 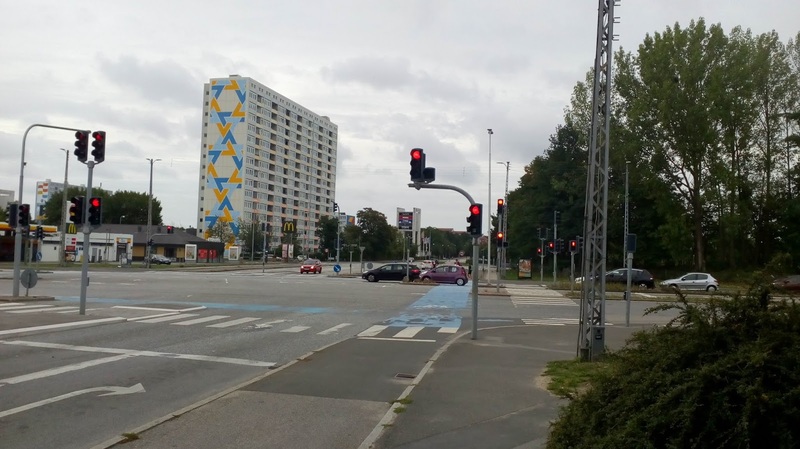 As with Malmö, I ended up cycling into the city from the suburbs which gave me a chance to experience a wide range of design layouts as both a pedestrian and cyclist. I'll level with you. I love Copenhagen - it's great for cycling because it has an extensive network and it is true that even with roadworks, protection is provided. However, there is a huge amount of hype because what is not talked about is how awful many of the junctions are and how busy the city is with private cars. 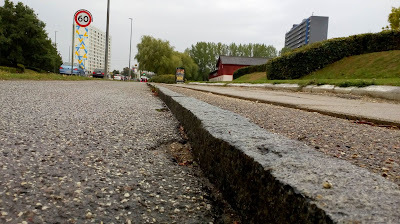 Above and below is are some typical details of Danish road design. A footway (this slab with stone block infill is all over the country) stepped above a one-way cycleway, stepped above the carriageway. Motor traffic lanes split into movements and all three modes move ahead at the same time with right turning drivers giving way to people walking and cycling ahead. Drivers turning left from the other direction are sometimes under their own stage, or they also have to give way to people walking and cycling. It's a very efficient set up because it limits the numbers of traffic stages. 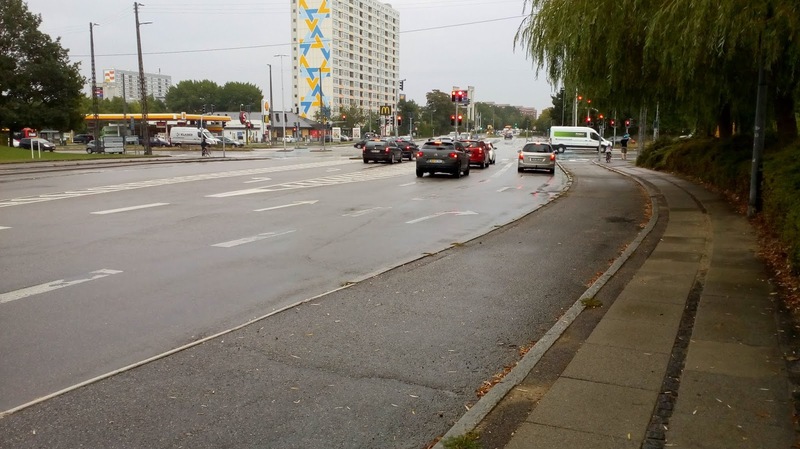 Unless there are any separated left turns (there are sometimes), you can run this on two stages all day long with pedestrians often getting a single stage to cross. The flipside is feeling intimidated by turning drivers and in the dark and rain, it's especially worrying. The Dutch have just got on with building the finest cycling network on the planet and the Danish (more generally) really do need to start copying them. However, you cannot argue with the numbers of people cycling which shows that even a flawed network is completely usable and my experience included cycling just over 10km from the suburbs to the city. So, out in the suburbs, we have a pretty standard layout (above) with driving, cycling and walking separated. People walking and cycling ahead have priority over turning drivers. Here we have a pedestrian crossing which is pretty typical of what I saw on these distributor type roads with a 60kph speed limit. Above, we have an interesting layout. It's the end of a 2-way cycleway which connects to Brøndby Stadium to the west of the city. The ahead movement for cycles is held on red because motor traffic is turning right across the cycle route, but you can turn right on a cycle here. The ahead movement gets you over to the cycleway on the other side of the road which is essentially a right turn. Most of the cycleways I used where one-way and this 2-way layout was quite unusual, although it was a perfectly sensible link to the stadium. 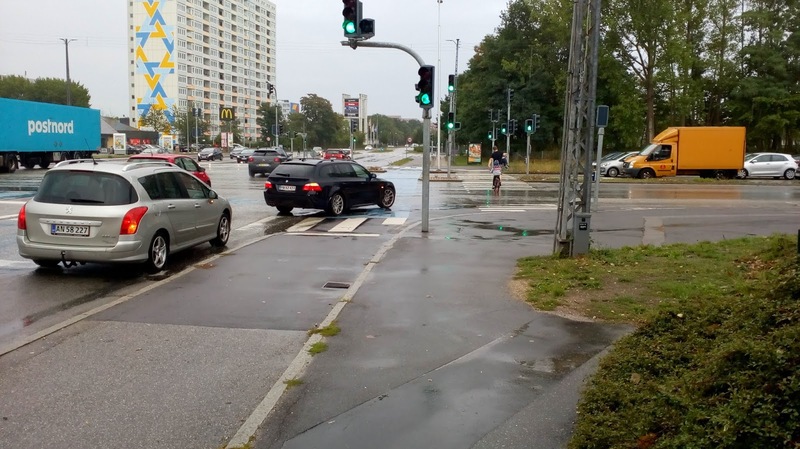 There is, however, an issue with the layout because when one turns right on a cycle at the same time drivers turn right, there is no protection from drivers cutting the corner. 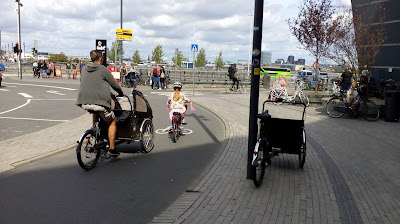 One great thing about Copenhagen is that it is designed to be multi-modal. Away from the city it's pretty sprawling and so if it is too far to cycle, features such as parking at this bus stop is useful. Park Allé (above) has an example of where the separate provision for walking and cycling gives up in favour of a shared path. It borders open space and so I saw nobody walking, so I guess it does the job for cycling OK. The other side of the road does have separation presumably as there is a residential area next to it. Here, I am on Avedøre Havnevej, about to turn left onto Allingvej which runs alongside a motorway. The turn is actually 2-stage. First, there's a crossing over the traffic lanes I am next to with a second stop line and a small island (just out of shot) in the middle of the road. I can't say it was pleasant and forget walking here! Allingvej itself is much nicer. Again, no footway on the side I am cycling along, but jammed up next to an acoustic barrier alongside the motorway, nobody is going to walk here. On the other side of the road there is a cycleway going the other way with a footway stepped up in level which is the classic Danish layout. Further towards the city, there is a great deal of redevelopment, but the familiar layout persists, this time with parking to the outside of the cycleway, although with no buffer to car doors (which isn't too much of an issue because the cycleway is wide and one-way). It was nice to see SuDS (above) being woven into some new layouts. Here we have a floating pedestrian crossing point and just after it, a bus stop. You'll have to forgive my sketchy location details because I was following a map on my phone and I forgot to make a note of some of the locations! 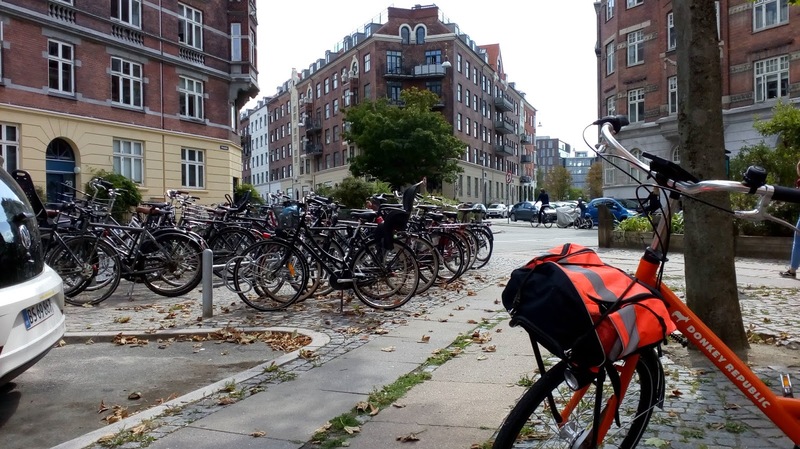 Despite the car parking, you'll see some informal on-street cycle parking in the areas approaching the city as on Ellebjergvej (above) which is the edge of the city limits. This is P. Knudsens Gade where the cycleway divides into a lane for right turners and a lane for the ahead movement. As you can see, there is a right turn traffic lane and the ahead cycle movement merges into it. Apart from having one's wits about them and drivers having to give way to cycles, this really isn't a pleasant or safe layout. In the photo below, cycling ahead has paint for protection, although by now, there isn't a right hook from drivers to worry about. At the next junction to the west (below), people cycling are moved right to be alongside a dedicated right turn lane which connects to another large road. People walking, cycling and driving get a green signal together and right turning drivers are expected to give way - even though the cycle stop line is a little further ahead of the one for drivers, it's essentially an advanced stop line which is useless when the green is already running. However, for the faults, the network persists through areas of great change as the old industrial areas are redeveloped. Eventually, the big roads end and we're in the older part of the city - the Copenhagen that most people see in photos and yes, there are a few bikes to see! Finally for this week, a little glimpse at what makes the city distinctive; Copenhagen is cargocycle-town!